Polyimide films used widely in electronics, aerospace, and aircraft industry as they are capable of withstanding high temperatures they are widely used to make flexible printed circuit boards and pressure sensitive tapes. Polyimide films enable implementation of compact and complex assemblies which minimizes size and weight. Polyimide films can withstand temperatures above 3000 C and are widely used for insulating wires and cables of motors and generators. Due to their lightweight they are also used in insulating the wires of aircrafts as it provides significant weight savings. According to the research report, the global polyimide films market is expected to be worth US$ 1770.1 mn by 2024 from US$927.7 mn in 2015. During the forecast period of 2016 and 2024, the overall global market is likely to register a CAGR of 7.5%. The increasing trend of miniaturization of electronic products and increasing demand for heat and fire resistant insulation films are expected to drive the market during the forecast period. However, the high cost of processing of polyimide films and its tendency to get hydrolyzed and shrink are anticipated to hamper the market during the forecast period. The application of polyimide films in flexible and thin photovoltaic materials and colorless polyimide films are expected to be the area of opportunity for polyimide films. Polyimide films are an ideal choice for usage as substrates in photovoltaic materials due to their high performance in the electronics industry, flexibility, and resistance to high temperature. Key applications of polyimide films include flexible printed circuit boards which accounts for more than 70% share of the global polyimide films market and is likely to be a highly lucrative segment during the forecast period. Wires and Cable insulation is expected to expand significantly during the forecast period. However the threat of substitutes from polyethylene terephthalate (PET) film and polyethylene naphthalate (PEN) film is expected to remain low during the forecast period due to the fact that, polyimide film has the advantageous characteristics of retaining its properties at high processing temperatures and provide a high range of operating temperature which is in contrast to PET and PEN films. The global polyimide films market is anticipated to expand during the forecast period. 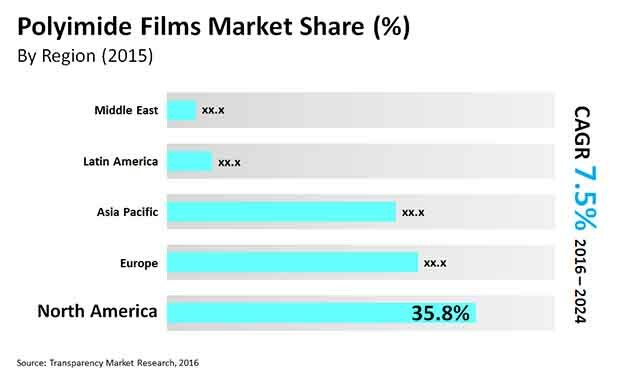 In terms of volume, Asia Pacific above 40% share of the global polyimide films market in 2015 owing the huge electronics industry in China, Japan, and Taiwan. North America is likely to follow Asia Pacific in terms of consumption. It is likely to expand due to huge aerospace industry in the region. Europe is also forecasted to expand during the forecast period. The key players of polyimide films market include Kaneka Corporation, DuPont, SKCKOLONPI Co. Ltd, Anabond Limited, Taimide Tech Inc., I.S.T. Corporation, Saint-Gobain Performance Plastics, UBE Industries Ltd, Toyobo Co. Ltd. DuPont and SKCKOLON PI are anticipated to be the leading manufacturers of polyimide films. Manufacturers are augmenting their production capacity to meet increasing demand from end user industries. Also, manufacturers of polyimide films are investing huge amounts in R&D for developing polyimide films which is shrinkage free. The manufacturers of polyimide film in China have eaten up the share of major manufacturers as Chinese polyimide films are available in low cost. Polyimide films are made from polyimide resins and are used widely as a substrate for manufacturing flexible printed circuits boards, pressure sensitive tapes for insulating wires and cables, and other applications such as barcode and labels. Polyimide films have advantageous property of heat and fire resistance, which make it a material of choice in the electrical and aerospace industry for insulating wires of motors and generators. Polyimide film is a preferred material for applications that require higher degree of dimension stability after exposure to high temperature. Key application areas of Polyimide Films is in electronics industry for manufacturing flexible printed circuit boards. Flexible printed circuit boards is expected to hold a dominant share of polyimide films market. The polyimide films market in Asia Pacific is expected to expand significantly during the forecast period. Based on the application and country, the report analyzes the attractiveness of each segment and country with the help of an attractiveness tool. The study consist of value chain analysis, which offers a better understanding of key companies in the supply chain from raw material manufacturers to end-users. Additionally, the study examines market competition through Porter’s Five Forces Analysis. Primary research represents the majority of our research efforts, complemented by extensive secondary research. We reviewed key players’ product literature, annual reports, press releases, and relevant documents for competitive analysis and market understanding. Secondary research also includes a search of technical writing, recent trade, Internet sources, and statistical data from government websites, trade associations, and agencies. This has proven to be the most consistent, effective, and productive approach for procuring precise market data, recognizing business opportunities, and understanding industry participants’ perceptions.